Most wine-lovers suffer a sense of loss and enter a period of mourning, whenever a producer such as Gentaz-Dervieux ceases to exist. Even a change in name can bring out the black armbands and black veils. Perhaps the most well known are Château La Tour Haut-Brion and its white counterpart, Laville Haut-Brion. Prompted by a recent thread on Your Say, the Vinous subscriber forum, this Cellar Favorite takes a brief look at a dozen or so mature vintages of Laville Haut-Brion, mostly from the 1960s, 1970s and 1980s. With the 2009 vintage, Laville Haut-Brion was renamed La Mission Haut-Brion Blanc by Domaine Clarence Dillon. Yes, it was just a change in the name. But I cannot deny that my heart sank a little, as part of its identity and uniqueness were sacrificed. The vineyard was originally comprised of 60% Sémillon and 40% Sauvignon Blanc, though later figures show a reconfiguration to approximately 70% Sémillon, 27% Sauvignon Blanc and 3% Muscadelle. In some vintages the estate produced a “Crème de Tête,” including in 1945 and 1964, to my knowledge the last vintage that this was done. Later vintages were fermented in barrel and matured entirely in new oak for around 15 months, with an average production around 1,000 cases. The final vintage was in 2008. Like many, because of the small production, I have not tasted Laville Haut-Brion regularly but when I do, it is always with great anticipation. Two rules. Firstly, Laville Haut-Brion habitually requires bottle age and as such I would recommend two decades in bottle to experience the real essence of the wine. Secondly, decanting is mandatory. Trust me – there is no other Bordeaux wine that will sit in your glass like a grumpy teenager as Laville Haut-Brion. It usually takes two or three hours and then suddenly it will awaken and produce gorgeous aromas of beeswax, dried honey, at times Japanese yellow plums and citrus fruit. Many of these tasting notes stem from a small private dinner held at Portland restaurant in London with friends, themed around mature white Bordeaux. (It included several vintages of Haut-Brion Blanc that I will write up separately.) The tasting was a pertinent reminder that Laville Haut-Brion pays no heed to the reputation of the growing season. The 1972 Laville Haut-Brion probably gives more enjoyment than any other Bordeaux white or red. Perhaps the same could be said for the lost gem of the decade, the wonderful 1994 Laville Haut-Brion. There does appear to be a sweet spot in the sixties. Several bottles from this era performed magnificently. The 1961 Laville Haut-Brion is absolutely gorgeous and, after 56 years, appears undimmed by age. Honeyed/straw in colour, the 1961 is rich and generous on the nose, with a touch of eucalyptus and juniper berries. There is a sense of extravagance about this Laville Haut-Brion and then after a couple of hours in the glass it becomes more refined and graceful. There is outstanding delineation in situ, harmonious and poised with a nigh perfect seam of acidity. It is imbued with a very subtle salinity: a gentle and sophisticated mature white Bordeaux that might not be up there with say, the 1962 or 1964...but it is not far behind. The 1962 Laville Haut-Brion is a rare dry white Bordeaux that I had only encountered once before. This bottle replicated that awe-inspiring performance. Still sporting that faded straw color; the 1962 has an exquisitely defined bouquet with wet wool, desiccated orange peel and that trait of damp straw that I observed before. And likewise, with aeration it appears to blossom in the glass. The palate is medium-bodied with fine acidity that cuts through what feels like a thick, waxy texture. The 1962 is very concentrated, with notes of lemon curd, frangipane, bitter lemon and nettle soup, and just a little VA towards the finish. Yet you cannot deny the harmony, the panache of this superb Laville Haut-Brion that might be just considering its downward slide. Tasted at a white Bordeaux-themed private dinner in London. The 1964 Laville Haut-Brion remains one my favorite vintages. This bottle repeated two previous showings (indeed, it may have come from the same source). Still appearing more youthful than the 1962, the bouquet is stunning, one of the most complex that I have found on a mature Laville Haut Brion: melted candle wax, Cornice pear, Japanese yuzu and just a hint of kerosene, quasi-Auslese in style. The palate is beautifully balanced, with a fine bead of acidity, demonstrating more mineral tension than the 1961 or 1966. with a creamy-textured finish. As I have remarked before, the palate cannot hope to match that show-stopping nose...but at least it tries. If you do possess any bottles, then take my advice and give the wine a couple of hours in the decanter. Tasted at a private dinner with a private collector in Tokyo. Having tasted the 1966 Laville Haut-Brion three times now, I know it can be an outstanding Pessac-Léognan. This was not in the same class as the bottle tasted back in 2015, although it still shows its class. Closed at first, the 1966 then opens with those disarming lanolin and wax resin scents, albeit without the delineation of previous bottles. The palate offers notes of dried pineapple, quite saline in the mouth, with strong and powerful honeyed notes towards the finish. This certainly improved in the glass, gaining more precision and mineralité. Superb. Tasted at a private dinner with a private collector in Tokyo. The 1971 Laville Haut-Brion is slightly oxidative on the nose, with walnut and marmalade scents, and not nearly as vital as the follow-up vintage. The palate shows more composure than the nose, with a satisfying viscous texture and a walnut tinged finish that perhaps is beginning to feel fatigued. Tasted at a private dinner. The 1972 Laville Haut-Brion was born in an inauspicious vintage for the region, although dry white Bordeaux tends to follow its own rules. It has a lucid straw hue. The bouquet is certainly still lively after 45 years, with melted candle wax, Mirabelle, a hint of marmalade and pressed yellow flowers. Although the 1972 does not quite possess the detail of the 1966 Laville Haut-Brion, I notice that it gains more delineation with time in the glass. The palate is extremely well balanced, with satisfying weight; maybe a little short, but there is probably more freshness here than all the 1972 red Bordeaux combined! It reveals mandarin and hints of ginger with time, so that after a couple of hours it turns into probably the best 1972 Bordeaux you could drink. Tasted at a white Bordeaux-themed private dinner in London. The 1979 Laville Haut-Brion is a good but not a great vintage. There is a little cheesiness on the nose. This ebbs away, and the wine becomes steely and a bit one-dimensional, although there is a pleasant tang of stem ginger. The palate exhibits touches of oxidation. Bottles should be consumed in the near future. Tasted at a white Bordeaux-themed private dinner in London. 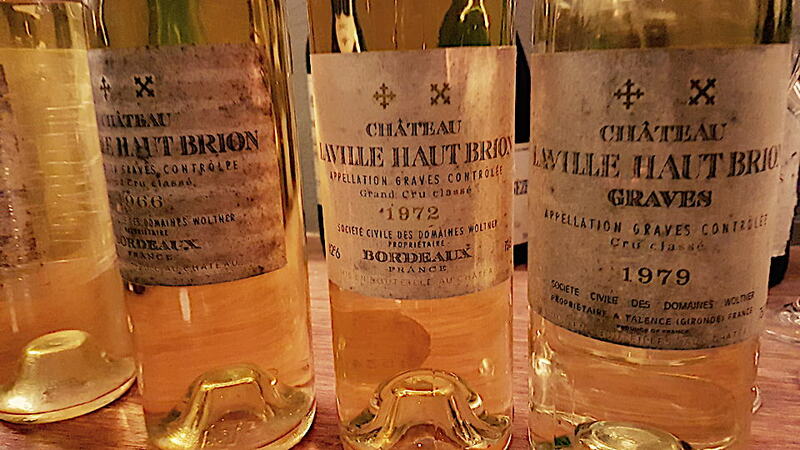 The 1980 Laville Haut-Brion came from the same person who organized the mature white Bordeaux dinner. It is better than expected, with a resinous, dried flower bouquet and hints of furniture polish. The palate is simple but more malic than other vintages, developing a light but noticeable fungal scent with aeration. The 1982 Laville Haut-Brion is a vintage that by chance, has been opened two or three times in recent months. I am not going to complain! Just as I expected, there was no point approaching the glass for the first few hours or so. Recalcitrantly offering little on the nose, the 1982 then (as in the past suddenly) changes its mind and offers wonderful lanolin, honeysuckle and Mirabelle scents that just seem to “curl” themselves around your senses. The palate is very well balanced, this example not quite as weighty as previous ones, yet it exudes precision on the almost Rhône-like finish. Maybe the 1982 is the best vintage of the decade? Tasted at a white Bordeaux-themed private dinner in London. The 1983 Laville Haut-Brion has a wonderful bouquet of orange blossom, beeswax, honeysuckle and linseed. This is nicely detailed and displays wonderful focus. The palate is very well balanced, with notes of orange zest, nectarine and yellow plum. There is an appealing waxy texture that develops on the second half. This 1983 is so harmonious, with flecks of white chocolate and almond towards the persistent finish. Tasted at a white Bordeaux-themed private dinner in London. The 1987 Laville Haut-Brion is a vexing wine at first. There is a “funk” on the nose, demonstrating a lot of reduction that I thought would never be rectified, even with vigorous aeration. However that potent struck match scent eventually does dissipate to reveal Laville’s trademark scents of honeysuckle and beeswax, a touch of pressed white flowers and fennel. The palate is well balanced, although, again, it takes time to reveal delineation and composure. There is pleasant weight and length, although it does not quite fire up in the glass like other vintages. Perhaps this is one where the sulphur management could have been better? Not bad, but not the best Laville Haut-Brion of the decade. Tasted at a white Bordeaux-themed private dinner in London. The 1994 Laville Haut-Brion is a vintage that I had never tasted before, and one touted by other critics. Here, even compared to an impressive 1986 Ygrec, this white Pessac-Léognan showed beautifully. Deep straw in colour it has a complex and enticing bouquet of clear honey, Japanese yuzu, fennel and nutmeg that is very well defined and with so much energy. The palate is tensile and underpinned by a fine bead of acidity, a subtle marine influence permeating from start to finish. This is a fantastic white Bordeaux given the vintage, and at 23 years of age shows no signs of slowing down. Tasted at a white Bordeaux-themed private dinner in London. The 2008 Laville Haut-Brion was the final vintage produced under this label. Despite that, like every other vintage, the 2008 remains stubborn and backward on the nose before deigning us with Conference pear, smoke and light wet wool scents, not unlike a Chenin Blanc! The palate is well balanced, with fine density, an undercurrent of hazelnut and hints of dried pineapple that segue into a gorgeous, again, quite nutty finish. It just needs more time.